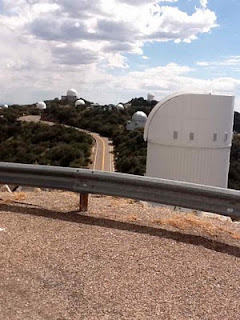 I'm still at Kitt Peak, on the 5th night of a 6 night run at the Mayall 4-m Telescope. Observing sometimes make me think of life in a nuclear shelter, post-apocalypse. No windows, no daylight, being very tired and drinking lots of coffee, which is not good given the nearest toilet is two floors down, down a very nuclear-shelter-like steel stairway. When the mighty dome moves, it's like another nuclear strike. 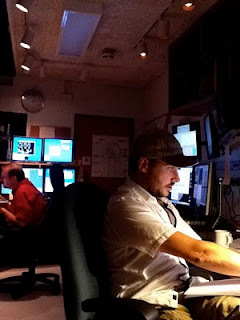 In the control room, it's a little dark, with music thumping, and science being done. My article, Long way to the chemist’s: a rough guide to distances in the universe, was published in The Conversation (in fact, it's lead article :). Following on from my article on stars, I was asked to think about distances in the Universe. "Space is big. You just won't believe how vastly, hugely, mind- bogglingly big it is. I mean, you may think it's a long way down the road to the chemist's, but that's just peanuts to space." I've spend quite a bit of time thinking about scale in the Universe, and remember animated discussions as a young PhD student with a good colleague on the question of "If the Milky Way was a 1p coin, how far away would the edge of the [Observable] Universe be? ", and the distance (of order a couple of km) always struck me as being exceedingly close! After a rushed week, it was time to hop on a plane and head for the US. After passing through LA Airport (not my favorite, especially given the time taken to fingerprint me and the several hundred people who arrived with me, but the passport checking guy was friendly and chatted about astronomy - holding up the hundreds behind me :), I got into Tucson yesterday where it was 37C. Today was the drive up to Kitt Peak, through very stark desert, with amazing cacti and people seemingly living in the middle of nowhere. Definitely cooler, the view from almost 7000 ft over the desert is very cool. Here's the view from the bottom of the 4m Mayall Telescope, overlooking the rest of Kitt Peak. The clouds, of course, aren't exactly a good sign, and we've lost a little time this evening to them, but things look like they will be running a soon. I will write a little more about the science later in the week. A quick post today, as I am running behind on a couple of things, but I have had a book review published in The Conversation. The book is The Fallacy of Fine-Tuning: Why the Universe Is Not Designed for Us by Victor Stenger, and is on a topic I have thought a lot about over the year, but never published on, namely "why are we here, in this Universe"? For those of a religious inclination, the answer is apparently obvious, the Universe was fine tuned to be habitable. For those grounded in a more scientific approach to understanding the Universe, the answer is not so clear and straight forward. If we start to play around with the fundamental physical parameters, such as the strength of forces etc, it appears we end up with mainly dead Universes. Heck, even messing with the content of the universe, in terms of the amount of matter, ends up with universes that collapse too quickly, or expand so fast that stars (and hence people) cannot form. Could physics predict a giraffe? I have a cosmological post brewing, so I thought I would touch on a slightly different topic, namely the question of "could physics predict a giraffe?" The following has the usual "buyer beware" clauses; I am a physicist, an astrophysicist at that, and not a chemist, or a biologist, and definitely no a philosopher of science, although I may end up annoying all of them. To start with, let's look at the subject, to wit, a giraffe. You'd think as a teacher of relativity, I would understand time a little better, but I seem to have little clue to where it all goes every week (luckily Sean Carroll over at Cosmic Variance points out that time is a more slippery customer than you may expect). It's been a little while, so I thought I would catch up on my 2D Universe. Those who have been following closely will have seen that we have derived our equations of motion over the surface of a sphere, and now all we need at the acceleration terms. This is where it starts to get a little sticky. The first part is the easy point. If you remember, we want a gravitational-like force, and this depends on the distance between the two objects. Now, again, there is more than one way to skin a rabbit (is there?) but I am going to take the computationally simple approach.